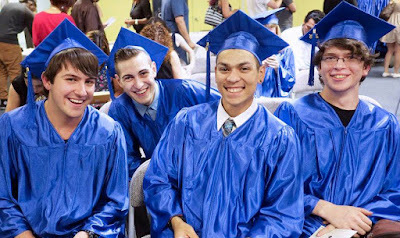 Rio Salado College | RioNews: High School Equivalency Graduation Coming Soon! High School Equivalency Graduation Coming Soon! Congratulations to Rio Salado’s High School Equivalency (HSE) graduates! We look forward to celebrating your hard work and accomplishments with you. We invite you and your loved ones to join us for the HSE Graduation Ceremony on Thursday, May 18 at 7 p.m. The ceremony will be held at North Phoenix Baptist Church, 5757 North Central Avenue, Phoenix 85012. Here are some additional details you will need. Parking is available first come, first served (large parking lot at venue). Consider taking the Valley Metro. Arrive early for the best parking and to avoid traffic delays. For those who cannot attend in person, the event will be streamed live during the event. Watch Graduation Ceremony Live. GradImages will take photographs of graduates. Proofs of these photos will be made available at gradimages.com and can also be purchased directly from GradImages by calling 1-800-261-2576. May 18, 2017 coincidentally is the second annual GED® Grad Day when the GED Testing Service® throws a virtual party for GED® graduates, celebrate all that they have accomplished, and encourage the next generation of students to fulfill their potential. It takes place primarily on Facebook, Twitter, and Instagram. It's open to everyone, whether you’re celebrating your own accomplishment, congratulating your bestie, or a teacher feeling proud of your student. Visit the GED® Grad Day page to get involved or use #GEDGradDay. Rio Salado encourages you to share your story and tag us on Facebook, Twitter, Instagram, and Google+ and use #RioGrad. We are excited to learn about your educational journey on this special day. We look forward to celebrating your achievements with you! Labels: College Bridge Pathways, Excellence in Education, GED, RioGrad, RioLearn, RioLounge, RioNews, RioSaladoCollege, RioStudents, RioStudents.